The tracks and waypoints can be found here in gdb and in gpx format. Comment: hot shower, TV, very slow Wifi, fan, other rooms with more space and/or A/C cost more. Bike parking: Across the central plaza at the church. It was free and locked during the night. Dogs: free, but had some trouble to get Peto in. Comment: cleanish, bathroom window, hot shower, slow Wifi, TV. Basically three hotels denied to host pets. This last one only allowed after some discussion. The other hotel which was quickly saying ok was the Real Hotel Huascaran but the prices were 90sol for a single and 120sol for a matrimonial. Comment: cleanish, window, hot shower, no Wifi, TV. Dogs: free after some discussion and the fact that Peto is a small dog. Comment: window, electric shower head, no Wifi, TV, balcony, they seem to have another hotel in the centro. There are about 10 hostal nearby this one. 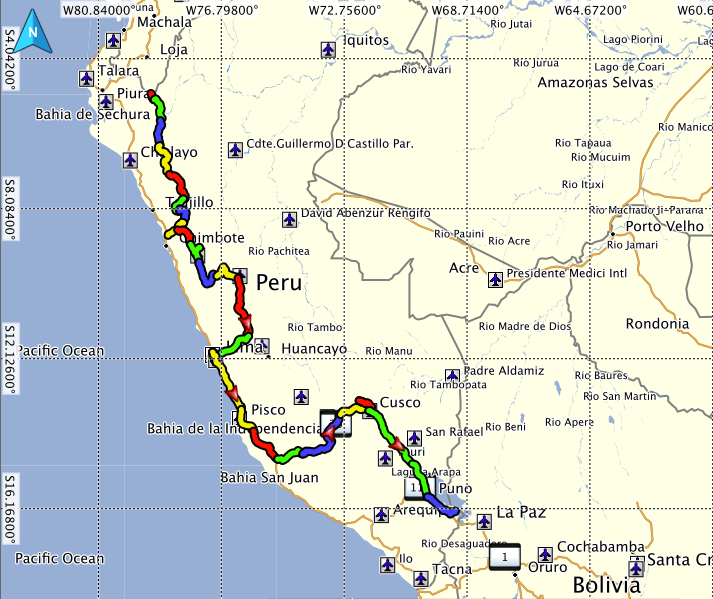 I stayed there for three nights/days to get some stuff organized in Lima. Pets are for free and private parking where the garage was in the house. The owner was very friendly and helped me fixing a puncture in my tire. The internet was good speed especially in the hallway. I could use the fridge. The room was very hot and later during the first day the owner brought a fan. The room was big and the bed was huge - very comfortable. The place felt more like a private place than a hotel since there was no reception and I got the keys to get in and out by myself which was good. Besides the issue with the water (I noted it was fixed when I left), it was a nice stay. The neighborhood looks average to me, plenty of kids playing in the streets in the evening. There is a Tottu's supermercado a few blocks down the road. The room (the one with the Jacuzzi) was pretty hot. Other rooms do not even have a window towards the outside. On the first day I wanted to test the Jacuzzi but there came no hot water as the hot water seems to come only around 6PM. The next day there came no water at all, after complaining there came only warm/hot water and no cold water. Anyway the flow was so little that the Jacuzzi would have taken hours to fill up (normal fill time is 60min). In the end I could not use the Jacuzzi. The place is almost idyllic and 8km away from Cusco center (taxi takes 15min and costs about 12sol) thus ideal for folks like me who loves to walk with the dog. Plenty of green around and its a delight to have a walk in the neighborhood. Dogs are for free even though the owner might not allow your dog inside the room (at least she hesitated to allow my dog into the room or it was a language misunderstanding). Parking on the lawn inside the yard. very nice garden to sit, relax and enjoy the great view over Cusco. The big rooms are absolute fantastic and are really worth the money. The tiny one (which I had in the 2nd night) is about average. Wifi was fast. There was drinking water available in the kitchen. I had a small medical issue and the owner was so kind to find out an English speaking doctor who was on duty on Saturday. The upper security gate was closed in the evening and the taxi had to take the lower one (if you come with your own vehicle or the taxi does not know it you have to walk). I did not get a key to the property door so I had to knock on the main door and wait for the mercy of the owner to open. I had booked a twin room (25m2) but it was still occupied. So I got in the first night a big room (25m2) with private bathroom (which was nice) but in the 2nd night a very small, hot room (12m2) without proper air circulation. I have slept in smaller rooms but this room was far below my expectations compared to what I had booked! Shared toilet was not cleaned, had no toilet paper and there came no water in the shower. On the second evening I tried to get out to have an evening walk but the door was locked and bolted thus I could not get out by myself.